After my posts criticizing AncestryDNA for their handling of "Chris and Pat's" matching, it is only fair to report the terrific news that the second adoptee mentioned in my original story (let's call her Jenny) has confirmed that her close match is, indeed, authentic. A few weeks ago "Jenny" reported that she received a match with a predicted first cousin at AncestryDNA. Today we received the news that Jenny has actually found her biological paternal aunt! 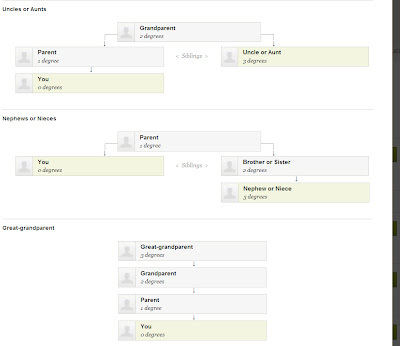 At first I thought there was a discrepancy between the prediction and the actual relationship, but after seeing screen grabs from Jenny's account, I realized that Ancestry has two different categories that each include first cousin; one is "Close Family - First Cousin" and the other is "First Cousin - Second Cousin". 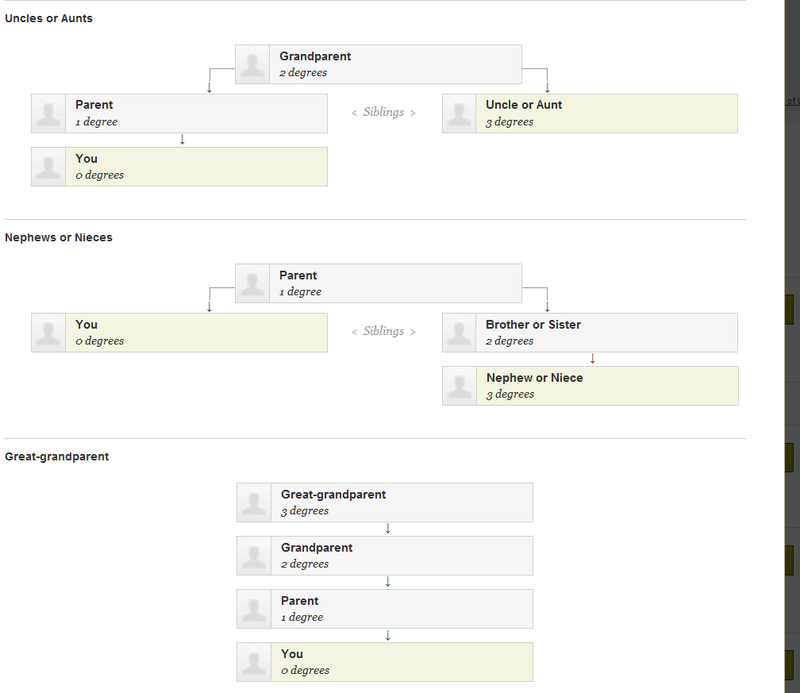 Given this opportunity, let's take a look at Ancestry's "First Cousin" categories. Since I have this same cousin available for comparison at 23andMe, I can tell you that she shares 14.5% of my mother which is a bit higher than average. So, AncestryDNA got this right even though Vi and my mom share more than would be expected for a first cousin relationship. I share a first cousin once-removed relationship with Vi and 7.44% of my DNA, and she correctly falls into the same First to Second Cousin Category for me at AncestryDNA. This is the category that the Jenny's match was placed, so in this case AncestryDNA's prediction was also correct. If this is close to their actual thresholds, then the Close Family Category could include half-siblings, grandparents, aunts and uncles (as we have seen in Jenny's case) and possibly great grandparents/first cousins who are on the high end of expected shared DNA. With all of this analysis, I don't want to get sidetracked from the joy of this story. Jenny is absolutely thrilled to find her paternal birth family and they seem to be thrilled to find her! She is very appreciative of AncestryDNA's part in her discovery and, thanks to that aunt who is a member of Ancestry.com, Jenny already has an extensive genealogy for half for her biological family! I need to give AncestryDNA some credit, they were 100 percent right on this one. Although I still stand by my opinion that their system needs changes, because there still is no way to know if there are errors...They need to release the raw data, not everyone is going to be as lucky as I was, but I also don't want to discourage people from submitting their DNA. The more DNA they receive, the better the results I would presume. They have a great system for the most part, but with no way to interpret it, we have to just have blind faith in Ancestry that our results are correct. Personally, I am very happy to be able to report this positive flip side to my earlier story because I do not want to discourage anyone from participating in DNA testing. Although not my first choice, with a database that has exceeded 65,000 (judging from recent ID numbers), AncestryDNA is a viable place to search for relatives whether it be for adoption reunification or genealogical purposes. You can bet that we, as a community, will keep badgering the folks at AncestryDNA for our raw data and access to more detailed genetic information, but some will enjoy success with their matching system even as it currently is. In fact, because of their outstanding automated matching combined with their vast collection of already existing family trees, a number of individuals have already reported confirming many common ancestors with their matches at AncestryDNA and, in some cases, broken through decades-old brick walls. These successes could greatly aid in, perhaps, the loftiest dream of our community - to build a universal genetic family tree by "assigning" DNA segments to specific ancestors, but only if AncestryDNA decides to release the genetic data to their customers. Let's keep our fingers crossed that they will soon listen to us, because what a wondrous thing this could be!